It’s been a great day. It wasn’t easy. But overall a great day. I got to plug my phone in at the store at Tuolumne Meadows (TM) and verify that it will charge – very slowly- but at least it charges. I don’t know what happened to my Suntactic solar panel. It won’t charge my phone at all anymore, so it was a relief to learn it’s the solar panel and not my phone. However, for some reason my phone still does’t seem to hold a charge. The cold nights must have fried the battery. I’m relieved I can at least get in touch with my friends and connect to my world when I get off trail. 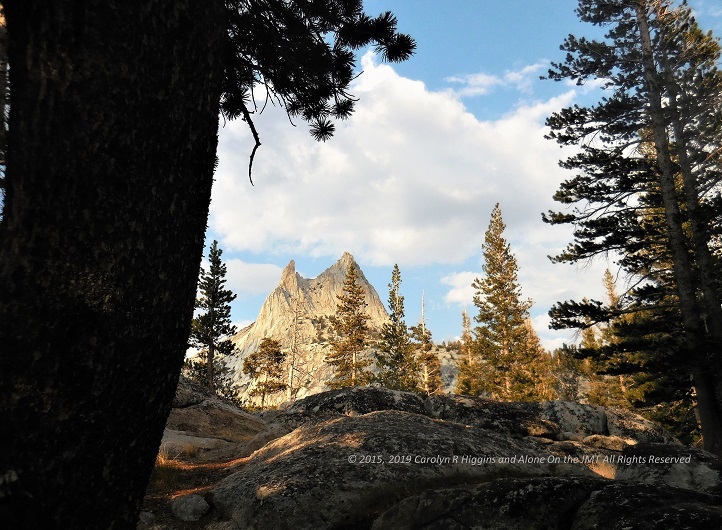 I was also able to confirm my plans with my friend Steve: I’ll get to the Yosemite Valley backpackers camp the day after tomorrow and he’ll pick me up the next day to drive me back to my car at the Cottonwood Meadows Trail Head in Lone Pine. Despite the challenges I faced at the beginning of this whole adventure, it’s working itself out. Thank goodness for my friend Steve, who generously offered to drive from the Bay Area to help me out, so I don’t have to do the 200 mile hitch! I also got to check on Capone! When I called Camp Four Paws and they told me he’s great; “happy” and “content” they said. I cried with relief. He’s alive – and doing “great”! I bet the job of the staff is as much about reassuring worried pet parents as it is taking care of the pets. But at least no I know he’ll be there when I get back in a few days! I can’t wait! I literally felt lighter, like I’d pulled 100 pounds of rocks out of my backpack. I should have called sooner! At some point today as I labored up yet another hill, I realized I haven’t had a zero day since Sallie Keys Lake, ten days ago. I probably should have taken a day after my resupply at Red’s to rest. But being so close to the end, I just wanted to push trough. I’ve been anxious to get back to Capone. Now that I know he’s ok, I don’t feel the need to rush: I have three days to cover twenty miles. I can hike as slow or as fast as I want. It seemed to take forever to get to TM this morning. I hadn’t realized that Tuolumne Meadows Proper is NOT the store and café. I had a bit of a false summit moment there, thinking I’d reached my destination only to realize I hadn’t. TM central has a lodge, a ranger station and employee camp. The campground and store are a few miles away. I wandered around the huge confusing compound feeling frustrated and lost until I finally got a ride from someone (more on that in a minute). The hike out of TM was a long steady climb on a soft wooded trail cushioned by millennia of crushed pine needles and dirt. It could have been treacherous, but after all the passes I’ve climbed, it really wasn’t too bad, even with a few of my usual bouts of grumpiness and WTF moments. At the end of the day, I ended up in the most perfect spot you can imagine at Upper Cathedral Lake. 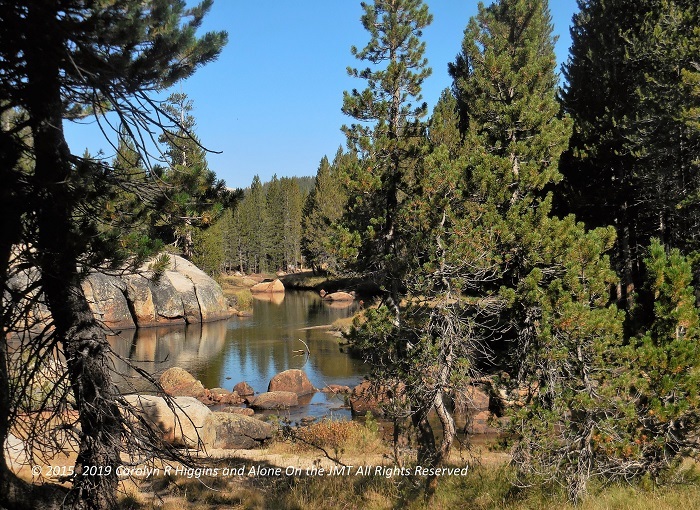 My camp is snuggled in a forest of Pine and Fir trees, anchored on one side by giant slabs of granite. About 20 yards behind me is the Upper Cathedral Lake which mirrors the majestic Cathedral Peak in its still cool cobalt water. I plan to hike about ten miles to the Little Yosemite Backpacker Camp tomorrow night which is just about five miles from the Valley floor. I suspect it’ll be crowded, being so close to everything and I have a feeling this is my last real night on the trail. 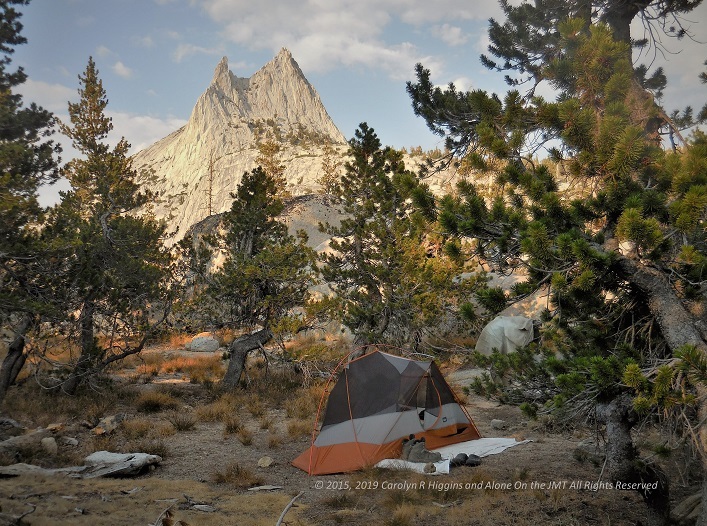 How fitting that I’m spending it in the presence of the noble and majestic Cathedral Peak, Mother Nature’s shrine, marking the end of my John Muir Trail journey. What’s a mile or two in the scheme of things anyway? I mean, with starting at Cottonwood and the resupply in Independence (and crossing Kearsarge Pass twice), I added about 40 miles to the 211-mile JMT as it is. I don’t think getting a ride for two miles is the end of the world. Lori was grateful for all my knowledge of the trail and I was grateful for the ride. I also met a nice couple from San Diego who were heading to Lyell Canyon for the weekend and told me there was no water until Merced which was about 15 miles away. The husband enthusiastically shook my hand and congratulated me as we parted ways, going opposite directions on the trail. 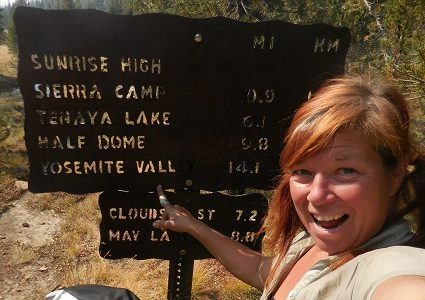 All day long, I met day and weekend hikers who were anxious to hear about my adventures of spending 24 days alone on the trail. Many of them expressed regret that they could only dream of hiking the trail. I received so much encouragement and so many “congratulations” and “you inspire me’s”. It was kind of hard to take in. What? I just hiked and whined for 24 days and I ache all over. So what? But then I remembered my first few days on the trail and being in awe of the thru-hikers I met. Many of whom looked as weary and exhausted as I feel. About a week ago, as I put a hundred miles or so behind me, I realized I’d hiked my way out of newbie status and into veteran status. I kept meeting hikers who started 7, 5, 3 days ago and I was all “wow, you’re fast.” It took me a bit to realize no they weren’t fast, that’s just how far I’ve come and how close I am to the end! I’m 7, 5, 3 days away from the end! And it dawned on me, I’m now one of the people I was inspired by and in awe of at the beginning. I’ve done it. Holy cow. I’ve done it. When I thought of it like that, it dawned me: I think I might be proud of myself! The sun has just slipped below the horizon and a few sparkling stars are claiming the dusky sky. It’s too warm to go in my tent so I lay sprawled on my bag atop a giant granite rock above my camp watching the night sky edge out the day. I try to stretch away the aches in my legs, feet and back. I didn’t sleep well last night because my hips were hurting so bad. I already took some Ibuprofen with my dinner of rehydrated potato curry and Bobo’s lemon bar; I hope it helps. Sleeping on the ground for 24 nights doesn’t help refresh an achy trail-weary body. Several people traipsed through the forest around me scouting for a spot to pitch a tent late this afternoon after I set up. Luckily, they camped far enough away that I don’t see or hear them. It’s just the hush of nature and the not-so-subtle roar of airplanes above; an unfortunate side-effect of Yosemite’s geography. It’s lies below the flightpaths of planes from Los Angeles to Seattle, Vegas to Reno and San Francisco to Phoenix. It seems every airplane in the country flies over Yosemite. It kind of harshes the mellow of nature. I lay on the rock thinking of the fun day I had loitering at the TM store and Grille , using the outlet inside the store to charge my phone, texting people and soaking up the celebratory mood of happy RVers and campers on vacation. I especially enjoyed feeling like legitimate hiker trash; grungy, serene and nowhere to be other than sitting on the blacktop with my back against the store, backpack next to me waiting for my phone to charge. I felt free. However, it appeared there was more legitimate hiker trash mulling about – people who looked like they live deep in the forest all summer long – or maybe they were SOBO PCT hikers. Whatever their stories, they looked like they’d been on the trail a lot longer than 25 days! I could tell by their long beards, tiny packs and shredded boots. Yep, I’m baby hiker trash! The store at TM is stocked full of everything a hiker, camper or passing tourist could want; from the usual junk food fare, ice, bumper stickers, magnets and shot glasses to batteries, lanterns, t-shirts, fishing gear, mouthwash, allergy medicine, ice cold drinks, Mountain House meals, stove fuel, socks, hats and even fresh fruit. I bought some vegan dark chocolate bark with almonds and sea salt a banana, waterproof Band-Aids (to try again to cover my fingertips which still have the open and excruciatingly painful splits), and more ibuprofen. I packed a lot of “vitamin I” but it wasn’t nearly enough. I was so excited to see a veggie burger on the menu at the Grille. I sat at a picnic table outside among the shiny happy tourists who watched me curiously as I devoured a black bean burger and a big order of thick delicious steak fries smothered in catsup and hot sauce and washed it down with an extra-large ice-cold Arnold Palmer (extra ice!). I’m filthy and my clothes are hanging off me. I’m quite a sight; confirmed by my first look in the mirror in 24 days. I couldn’t believe my eyes! I’ve lost some weight and I can’t wait to go home and try on all my clothes to see how much I’ve actually lost (I don’t own a scale). After my long relaxing break at the store, it was time to get back on the trail. It was difficult to find it. After walking through the campground, I was told I had to walk down the busy paved road about ½ mile. I still couldn’t find the trail and wandered up and down the road several times before asking some local “residents” at a camp in the woods where the trail was. They pointed me back down the road about a quarter mile where I finally found it and started my climb. Back into the woods and on the trail, one day closer to the end. I’m in my tent now about to call it a day. It was hard to tear myself away from the gorgeous night and close out what feels like my last night, but I need to rest up for tomorrow: my last full day on the trail.